Side effect of snake bite on horse almost a year later. Last year on June 16 we were dealing with our first snake bit horse. You may remember the blog, complete with photos, documenting the whole process. 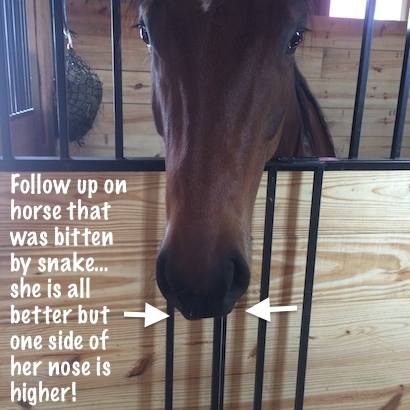 As Hope, the horse that was bitten, was hanging her head out of the stall yesterday I snapped this photo and decided to do a follow up. I laugh when I see her because she has an innocent look…and a slightly crooked nose! The only two signs she still has are 1) an altered growth ring on her hoof 2) a crooked nose. The ring will be grown out soon but the nose…I’m not sure if it will ever be straight. Either way she is still cute! ← Do horses get dizzy when they are learning to spin? Here is a link to the VIPER Institute located in Tucson, Arizona. It is very time consuming and expensive to make antivenom. http://viper.arizona.edu/video-archive. Click the “How Horses Help Make Antivenom in Mexico” video. So glad she’s ok! I’m wondering what vets in California would do. I haven’t had any snake bites with horses yet, but they do have to treat dogs very aggressively here. ..
One would think Texas would have much more poisonous snakes than here. She sure looks cute though! What is Hopes registered name ?? I believe that this could be successfully treated. There will be several reasons why this is happening. For sure, there will be fascia caught up in the poll with residual toxins as it is very common to see uneven nostrils when there is a tight poll, when the nerve endings are released, the face can then relax. A world wide respected Australian technique called Bowen is incredibly successful in releasing this sort of problem. Touch her poll, I bet it’s like a rock. Poor little girl i remember the blog well Stacy, it is great that you do a follow up, because you read a story and months later you are reading another story and you suddenly wonder how that horse is. Thank you for updating us on her story. She looks beautiful non the less. I’m curious as to what the Veterinarian says as to why the difference in her nose. Is that where she was bit? And is it a type of scar tissue?